In the mid to late 1930s jazz began to infiltrate the dance band scene. There were some skilled dance band musicians who, mainly by listening to American records, became skilled jazz players, but they earned their living in the West End dance bands playing jazz only 'after hours'. The public at large were luke-warm about jazz although some band leaders began to introduce it. Records of the period by Ambrose, Lew Stone, Ray Noble, Roy Fox and others are often spiced with so called 'hot' solos of a high order and in some cases were superb jazz. Following the end of the war in the mid 1940s, jazz divided - so called 'traditional jazz' began to flourish and eventually led to the 'trad jazz' boom of the 1950s and '60s, while the new jazz, called bebop or rebop began to be played in a variety of basements and drinking clubs in London's Soho. In January 1947 drummer Laurie Morgan returned from the USA with bebop records, and the enthusiastic young jazzmen all flocked to hear what Charlie Parker was all about. Young jazz musicians' joined Geraldo's Navy to hear the music first hand in New York. A flat shared by guitarists Pete Chilver and Dave Goldberg became a listening area as did the flat of Carlo Krahmer who later founded Esquire Records. Soon after that came the first UK record releases of the Dizzy Gillespie Band. Two months later the Moffat Club reopened at Mac's Rehearsal Rooms and all the young musicians including Hank Shaw, Bernie Fenton and Tony Crombie would go there and sit in. Dance music, as it returned in the mid 1940s was bereft of the jazz influence that had been creeping in just before the war. Anybody wanting to play jazz had to give up steady dance band work and commit themselves to the new music. There was nowhere to play the new jazz. Having split completely from the dance bands the bop pioneers had to produce a venue to bring it to the public, which was how the legendary Club Eleven brought bebop and the the modern jazz movement to a wider audience in 1948. Apart from Club Eleven, the new 'modern jazz' struggled for an audience in Britain. Many fans of the earlier forms of jazz, as well as current musicians were hostile to it. It needed a very high standard of musicianship to play it well, it used complicated chord structures and rhythms, angular lines and very fast tempos. The best performers were something of an artistic elite. This isolation meant that the new music became very much of a closed shop. In the early 1950s there was very little paid work available either recording or playing live and what there was went to the chosen few. In truth there was not much of an audience initially for this modern jazz. Bebop lasted for only a few years and by the early 1950s a new post-bebop type of modern jazz, branching in many directions and drawing on the 'cool' sound of Miles Davis, started to take over. 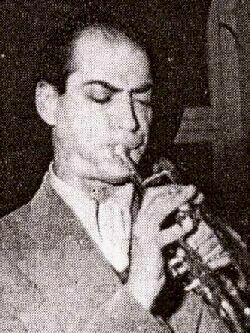 British modern' pioneers included Ronnie Scott, Johnny Dankworth, Jimmy Deuchar and Victor Feldman but the man who all of these musicians rated their inspiration was Denis Rose. There was little paid work available although the audience began to grow but the musicians needed other work to keep body and soul together. Some gave up on Britain's 'modern jazz scene'. Victor Feldman emigrated to the USA in 1955 to do studio session work with odd breaks for jazz, Jimmy Deuchar worked commercially in Germany. The Johnny Dankworth Seven formed in 1950 disbanded in 1953 when Dankworth more or less gave up jazz forming his commercially successful big band, but reducing the jazz content of his music, playing mainly for dancing or other pop work including backing the singer Cleo Laine. Other groups of musicians formed and reformed in different combinations in a bid to be successful. Recording opportunities were few and far between. Anybody with money to buy records bought the American music. Only small independent labels such as Esquire, in the late 1940s and 1950s, and Tempo in the mid and later 1950s were issuing records of the British version. We are indebted for their foresight in recording what they did. By the late 1950s only the Tempo label was recording significantly and that went out of business in 1960. After being unobtainable for nearly 40 years the Jasmine label reissued these classic Tempo recordings from the 1950s on CD. By 1960 the number of jazz albums issued featuring British musicians was declining rapidly, only Tubby Hayes seemed to be saleable..
1947 The BBC broadcast it's first 'Jazz Club' bebop session. A BBC series called 'Accordian Club' featured the early bop efforts of the Tito Burns Sextet in an unlikely setting. 1948 Formation of Club Eleven with bands led by Ronnie Scott and Johnny Dankworth. The first UK bebop records were produced by Esquire records featuring Ronnie Scott in the Esquire Five. This year also saw the issue of live recordings - also by Esquire, of Jazz At the Town Hall Ensemble featuring the Club Eleven musicians. 1952 Tony Kinsey formed his first small group and continued to lead his various quartets and quintets well into the 1960s and later. 1954 Tubby Hayes, at the age of nineteen, made his first records as leader, for Tempo. These featured his band and quartet. Hayes went on to become the most popular modern jazz player of his generation with records issued, at regular intervals in the 1990s although he died in 1973. 1957 The Jazz Couriers co-led by Tubby Hayes and Ronnie Scott was formed. This group became the most popular and successful British modern jazz group ever. (The Jazz Couriers broke up in 1959). 1960 Former Club Eleven pianist Tommy Pollard died after a long illness, having played little since the mid 1950s. This page was last updated during July, 2015.